Esoteric School of Shamanism and Magic Blog: Blessed Be! What Blessings Do You Wish for Others for This Coming Year? The holidays are a time for blessings and goodwill among humanity. Have you got a special blessing, prayer, mantra, or "pay it forward" treat you'd like to share with the rest of the planetary citizens out there? We invite you to do so on our Facebook page. The magical goodie that gets the most likes will receive any of our magical ebooks of his or her choice in the New Year (so be sure to Like our page so we can reach you!). If you don't have any special blessings or prayers to share, then it's about time you got some in your life. Here is a blessing ritual we'll start the ball rolling with. This doesn't have to be saved for night, but many people, couples and families like ending the day with this ritual each night before bedtime. It is a great ritual to incorporate into ceremonies or ritual circles or anytime you want to share peace, goodwill and blessings with others. You will need a Chalice (magical Water element tool), sea salt and spring water. Here's how it's done. 1. Holding the chalice with both hands in front of you flow water blue energy from one hand to the other, through the chalice. Continue until the chalice becomes warm or tingly. This "keys" the Chalice to the person holding it. At the end of the verses, blow water blue energy into the chalice and swirl the water one last time. The Chalice is now "charged." 9. If there are two people participating in the ritual, reverse roles and repeat the process. If there are many people, one person can bless everyone, and then one person in the group blesses the first person. 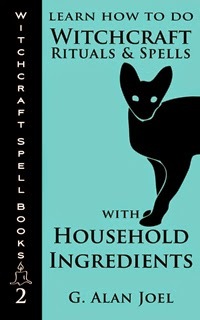 You can also do this blessing magic ritual on yourself or with your pets. Have a blessed new year and think about using this blessing ritual to get it off to a great start. Then you can share your experiences using it on our Facebook page and be eligible for the free ebook offering. Got Magical Questions? We Got Answers! Need Some Sacred Space? Wear This! Say Goodbye to A Bad (Magical) Hair Day!